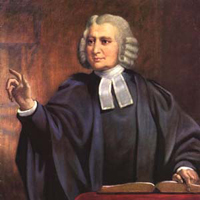 Charles Wesley (1707-1788) was a prolific hymn writer of the 18th century. Coming from a musical family, he left a lasting legacy of congregational song. Writing hymn texts that are solidly based on the Scriptures gives them an appeal across denominational lines. It is estimated that during his lifetime, Wesley penned more than 9,000 poems of a spiritual nature, 6,000 of which are hymns. His writings were passionate and well-crafted, conveying the true essence of Christian teaching. Wesley married Sara Gwynne in 1749. She was a constant companion to him on his evangelical journeys. Only five of their eight children survived infancy. Charles Wesley Jr. (1757-1834) and Samuel Wesley (1766-1837) were musical like their father, and his daughter Sarah (1759-1828) was gifted in spiritual poetry. A substantial number of his writings were completed while riding on horseback to his evangelical meetings. What really set Charles apart from other hymn writers was his effective use of scriptural allusions, providing a spiritual roadmap whereby individuals could imagine a Christ-centered life. Scholars suggest that he was able to compose about 10 lines of verse daily for 50 years. Charles’ brother John sometimes served as editor to his hymns. John’s typical response was, “some were good, some were mediocre, and some were exceptional.” John can also be credited with improving the singability of Charles’ hymns. Both John and Charles were instrumental in changing the spiritual environment of Britain during the 18th century. In doing so, they formed the bedrock of what Methodism has become worldwide. Their unwavering devotion to expressing Christian spirituality through hymns has impacted individuals across all denominational lines. “Love Divine, All Loves Excelling” was first published in a collection of hymns entitled Hymns for those that Seek, and those that Have, Redemption in the Blood of Christ (1747). The incipit (opening line) was a play on the opening line of John Dryden’s (1631-1700) poem “Fairest Isle, All Isles Excelling” set to music by Henry Purcell (1659-1695) in the generation before Charles Wesley was born. The tunes BEECHER or HYFRYDOL typically accompany the text in most hymnals. The hymn is written around a progression of thoughts: (1) our prayers for the Holy Spirit, (2) praying for the return of our Lord through the second coming, and (3) prayers for the finalization of his new creation. In comparing hymn stanzas across several denominations, very minor variances did occur, mainly in single word changes. However, in the Hymnal 1982 (Episcopal) stanza two is omitted. The original stanza expressed the Wesleyan concept of the “second rest.” When Charles referred to this in his hymns, it specifically applies to the “second birth,” “second blessing,” “second gift.” All of these are directed toward achieving full “sanctification” or “Christian perfection.” This is an important theological tenet of Methodist preaching from the very beginning. We are fortunate to be the recipients of the poetic genius of Charles Wesley. He influenced Methodism more than any other hymn writer. Upon hearing of Charles’ death, an elderly Londoner asked, “Who will write poetry for us now?” What better way to be thought of, than by your poetic and spiritual impact on congregational song? Mr. Beggs, a Master of Theological Studies student at Perkins School of Theology, Southern Methodist University, studies hymnology with Dr. C. Michael Hawn.